Location: Situated outside SE angle of Dockyard wall on an island site bounded by Melville, Pembroke and Market Streets. The Market was built by the Admiralty, and cost ú4,630/3/7d. Early views show the centre building with hipped roof, this was used variously as Corn Exchange and later Town Council offices. The market was bought by the Corporation 1881 and the roofs added to designs by K W Ladd 1884, but failed 1886 and were altered by K McAlpin, the Borough Engineer. 1826-7 enclosed market square, originally with lean-to shelters within the two-storey central building, but the S half given iron roofs 1886. Grey rubble stone walls with tooled stone plinth band and ridged coping. Ashlar angle piers. Central ashlar arches each side, rusticated with impost bands and coping. Walls follow line of slope to E and W sides, except at gateways which show curious difficulties of adjustment to the slope. 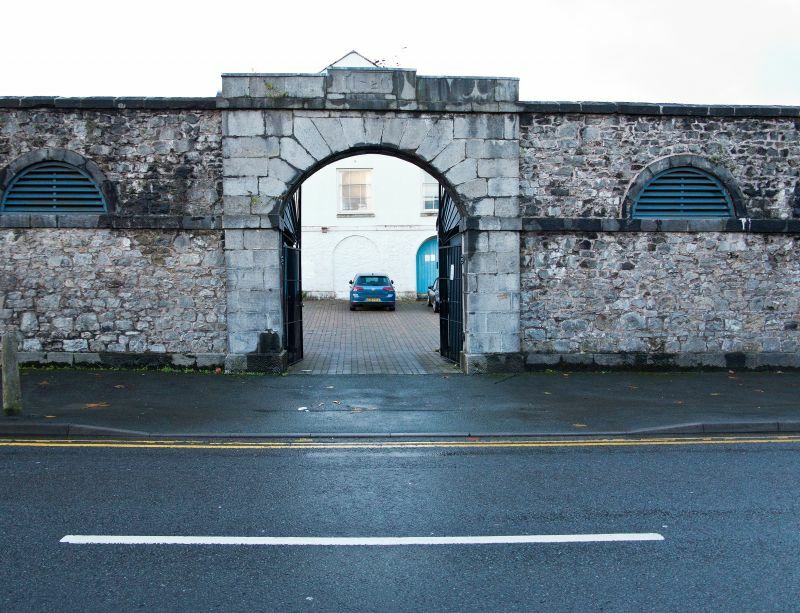 Main facades were N and S, eleven bays, the centre archway slightly enriched by stepped blocking course. Windows were probably all lunettes, as on N wall, where all are blocked, but S wall windows have lowered sills breaking sill band. N entry retains iron entrance gates, S entry is altered to public conveniences. E and W sides have nine bays, similar, but southern windows have lowered sills of later C19 and northern ones are blocked lunettes. Present entry is from E. N arch gives onto open courtyard with slate-roofed lean-tos, all altered for garages but iron columns surviving within. Central building is much encumbered by later additions but appears to have cross-gabled roof and is rendered on upper floors, painted stone below, with 3 blocked arches on S. The 1886 addition infilled the S half with five roofs carried on columns, outer walls and red brick rear walls. Gables above 1826 S wall, two to W are in original state with hipped raised clerestorys, the three to E have lost clerestorys since 1945. 1886 roofs are carried on iron posts. Thin steel trusses. Situated on N side of A4139 opposite Albion Square CP School to south.